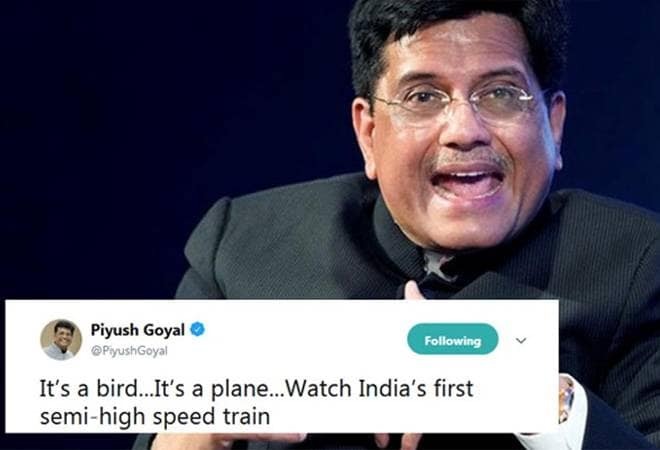 Railways minister Piyush Goyal was severely trolled on Monday for his latest tweet on Train 18, or as it is now called - the Vande Bharat Express. Sharing a clip of the train, Goyal marvelled at the "lightning speed" of India's fastest train. "It's a bird...It's a plane...Watch India's first semi-high speed train built under 'Make in India' initiative, Vande Bharat Express zooming past at lightening speed," he tweeted. Not missing the opportunity, Congress called the minister "Mr Ghotala" and said that the only thing travelling at lightning speed are Mr Ghotala's lies. Indian Youth Congress' campaign-in-charge, Srivatsa said, "Piyush Goyal ji, enough of your Jumlas. This video has been edited to play in fast forward mode. You have again proved that all that the Modi Govt can do is gimmicks. Even Shatabdhi, with such editing will look as fast." Not to be left behind, Trinamool Congress MP Derek O'Brien tweeted, "CheatIndia Exhibit 420". Not only politicians, Twitter users also called out the minister and said that the video was edited. Doctored video takes 12 secs, Original video takes 24 secs to travel same distance. I think anyone with common sense is enough to tell that video has been edited.Having said that,check YouTube and you'll find lots of videos of t18 running at 180kmph and it doesn't look like this. !